John Garbella was born early in the 13th century, somewhere near Vercelli. He studied at Paris and was ordained priest before 1229. He taught canon law at the University of Paris. While he was professor there, Jordan of Saxony (who was a friend of Saint Albert the Great) came to Paris, and John saw one after another of his best pupils desert their careers to join the Dominicans. He seems to have considered them quite objectively, without reference to himself, until one day he had an interior voice that spoke to him that it was God’s will for him to join the Dominicans. No one can say that John did not respond with alacrity; he dropped everything and ran down the street. (“Let me go; I am on my way to God!”) Jordan received him happily and gave him the habit. In 1232, John was sent to Vercelli to establish a convent there. He built this and several other convents in Lombardy as houses of regular observance. While provincial of Lombardy, he also became inquisitor. It was a particularly difficult moment. His brother in religion, Peter of Verona, had just been killed by the heretics in Como. The entire countryside was in a state of war, with roving bands of heretics and robbers. It was the task of the new inquisitor to try to bring order out of this chaos, and what John did was remarkable, considering the situation. In spite of his heavy labors, which included the supervision of 600 friars in 28 different cities (he reached them only by walking), John of Vercelli established the ideals of study and regular observance in all of his houses. It was the good fortune of John of Vercelli to live in an age that was well peopled by saints. He formed a close friendship with Saint Louis, the king of France. Several of his tasks in the order, particularly the Commission on the Program of Studies, he shared with Saint Albert the Great, Saint Thomas Aquinas, and Peter of Tarentaise (the future Pope Innocent V). In such company one would need to have a superior set of talents; John did. In 1264 the chapter of the order met at Paris. Blessed Humbert had resigned as master general of the order. John went to the chapter hoping that he could resign as provincial of Lombardy. Instead of escaping one office, he fell heir to a still more difficult one. He was elected master general in 1264 and served in that capacity until 1283. John was then a man in his sixties and was, moreover, handicapped by a crippled leg. However, he accepted the office which would require him to walk, not only all over Lombardy, but all over Europe. It took a brand of courage and obedience that was little short of heroic. 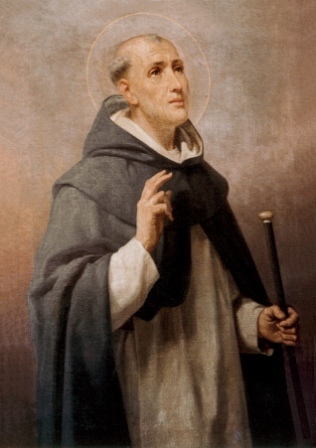 During the generalate of John of Vercelli, the relics of Saint Dominic were transferred to the new tomb that had been prepared for it by Nicholas of Pisa. When the transfer was made, John of Vercelli fixed his seal on the tomb; the seals were still intact on their examination in 1946. During the translation of the relics, according to the account in the Vitae Fratrum, when the body of Saint Dominic was exposed to view, the head was seen to turn towards John of Vercelli. John, embarrassed, moved to another part of the church and gave his place to a cardinal. Whereupon, the head of Saint Dominic was seen by all to turn again in John’s direction. On the death of Clement IV, John of Vercelli was very nearly elected pope. Being warned of the possibility, he fled in fright. However, his good friend Cardinal Visconti, was elected and took the name Gregory X. He appointed John as legate on several different missions. He was commissioned by the pope to draw up the Schema for the second ecumenical council of Lyons in 1274–that council to which Saint Thomas Aquinas was hurrying when death found him on the road. At the council John distinguished himself for his assistance by offering to the council the talents of his best men. At the council, he accepted for the Dominican Order the special commission of promoting reverence for the Holy Name of Jesus and fighting blasphemy, which was, in that day as in ours, a prevalent vice. He can thus be considered the founder of the Holy Name Society, even though the Confraternity was not formed until 1432. Several precious relics were suitably enshrined by John of Vercelli. These included several thorns from the Crown of Our Lord, which had been given him by Saint Louis of France. The cord of Saint Thomas, with which he had been guided by the angels and which he had worn until death, was given into the care of the master general, who gave it to the convent of Vercelli for safe keeping. John’s career was rapidly reaching its end. In 1279, he presided over the famous chapter of Paris at which the order made the doctrine of Saint Thomas officially its own. The following year he laid the foundations of the Church of Santa Maria Sopra Minerva. One of his last official acts was to provide for a work on the instruction of novices (Benedictines, Dorcy). Died: September 1283 at Montpelier, France of natural causes; buried at the Dominican convent at Montpelier; his tomb was desecrated by Calvinists in 1562, and his body disappeared.